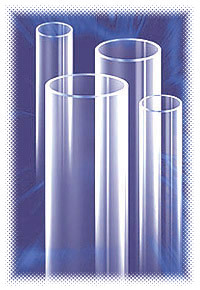 This widely used quartz lamp tubing is a kind of clear electrically fused machine-drawn tubing. It has characteristics of excellent visual, thermal, mechanical properties with tight dimensional tolerances. The spectral transmission from wavelength about 180-220nm usually reflects material purity for clear fused quartz. The presence of some metallic impurities will make the transmission decrease from wavelength about 180-220nm. As transmission curve illustrate, due to the presence of the higher content of some metallic impurities such as Fe etc., the transmission from wavelength 185-220nm which encourages the ozone generation is much lower. So this material can not be used for making ozone generation lamps. However, it still has a transmission of over 85% at wavelength 253.7nm which is ideal for making water purifying lamps and other UV germicidal lamps, because these UV lamps emit about 90% of their radiated energy at 253.7nm which makes the peak germicidal effectives occur. This quartz has a very good transmission at visible light range from wavelength 380-720nm. So this low cost material is accepted world widely for making halogen lamps, high pressure mercury vapor (HPMV) lamps and other lamps of general lighting system.